Good Stuff NW: In Season: Bound, Hop, Jump, Leap, Vault! No matter how you say it, spring in the Northwest is a much-anticipated season. 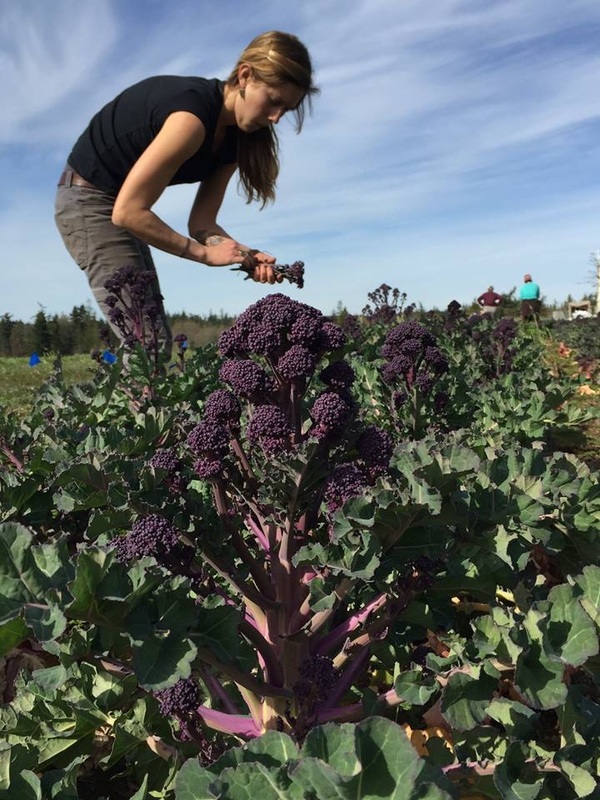 Gardeners are getting out their seed packets and determining how many yards of compost their backs can withstand—see this post about holding off on the tomatoes for now—and cooks are dreaming of the bright green herbs and greens that will soon festoon their tables. Seeing nettles and fiddleheads already popping up in my social media feeds, I figured it was time to talk with produce guy and fruit monkey Josh Alsberg of Rubinette Produce about what he's seeing on his local farmers' fresh sheets. So grab a pencil, kids, it's time to make our spring farmers' market shopping lists! Josh knows my weaknesses, so of course the first thing he pulls out is the list of the various raabs, rapinis and rabes on offer. 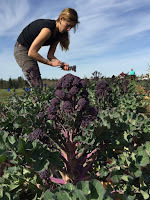 We could both hear Anthony Boutard of Ayers Creek Farm snorting that the only true raab comes from turnips, the rest are the inflorescence of plants, defined as "a group or cluster of flowers arranged on a stem that is composed of a main branch. Morphologically, it is the modified part of the shoot of seed plants where flowers are formed." 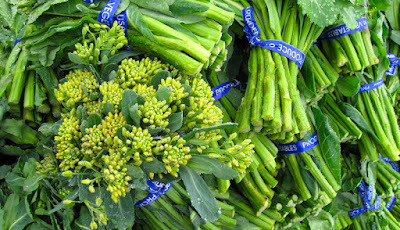 So, with that, in alphabetical order, look for these inflorescences at the markets: bok choy, brussels sprouts, cabbage, kale, kale sprouts, mizuna, red choy, spigarello, tatsoi and turnips, among others. Josh notes that each tastes slightly different depending on the parent plant's particular flavor profile, but all have that amazing, vibrant flavor and crunch when pan-fried—I like to brown a little homemade bacon and chopped garlic first, then add the greens, chopped or not—or, in the case of the bigger sprouts, roasted quickly in a hot oven. As for other greens, look for watercress, various mustards, mizunas both green and red, arugula, and a new one to me, wasabi arugula—Josh said it has the tangy bite of that Japanese root. (Note to self: must try.) Lettuces are just barely coming on but will be available shortly, and spinach, which is a bit more cold-tolerant, is here now. With spring running about a month later than last year, wild things are going crazy trying to catch up. 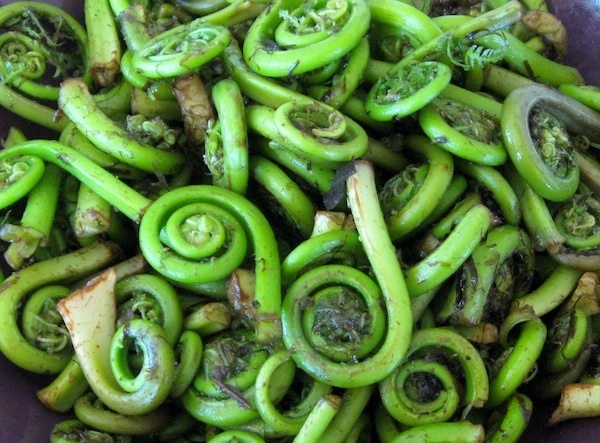 Look for the aforementioned fiddleheads, as well as "triangle leeks" or wild onions, which have a curious folded vertical green, as well as nettles. These will be available at the markets, but if you're headed out on a hike, here's a guide to foraging wild onions and garlic. 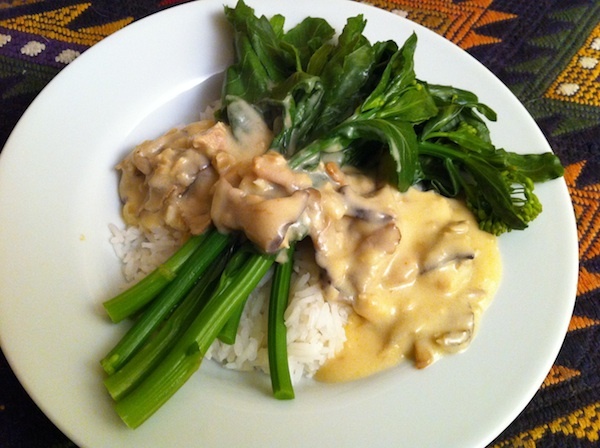 Calçots, that spectacular Spanish scallion relative pioneered in Oregon by Manuel and Leslie Recio at their late, lamented Viridian Farms, are appearing, too, so make some salbitxada sauce and throw a spring calçotada! Spring onions like Walla Walla and red onions should be appearing soon, but green garlic is here now—use them like scallions or make a pesto to toss with pasta or serve it alongside grilled meats and fish. 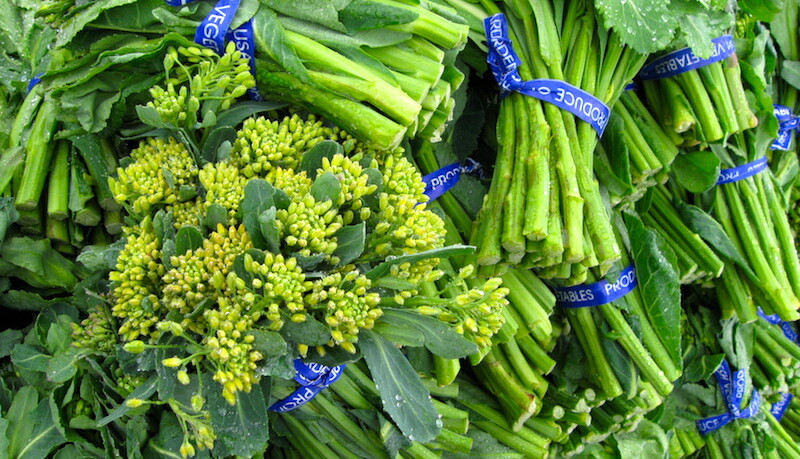 Dribs and drabs of local asparagus and purple sprouting broccoli—refer to it as PSB if you want to sound cooler-than-thou—are just now coming into season, but Josh advises that you need to get to the markets early to get the little asparagus available, at least for the next couple of weeks before the full harvest comes in. Bundles of fresh spring herbs like parsley, oregano, chervil, thyme and chives are beginning to show up, so chimichurries and other herb sauces are definitely called for. Microgreens and shoots of favas and peas should also make your list and will only get more abundant as the season rolls out. Radishes, spring beets and the small, white hakurei turnips as well as their greens are terrific roasted and served with the herb sauces mentioned above. Small local bulbs of fennel will be here toward the end of the month. 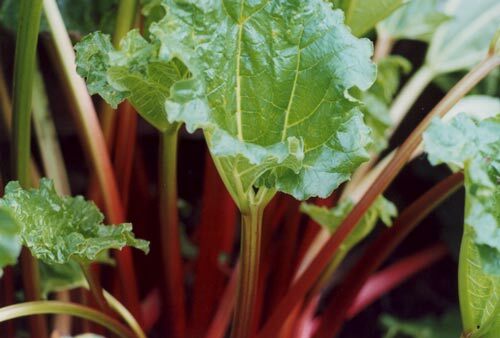 One of my favorite vegetables-that-cooks-like-a-fruit, rhubarb, is flashing its red stalks, and Josh said a green variety that, unlikely as it seems, is a bit more sour than the red variety, is also being grown locally. Look for local mushrooms like maitake and lion's mane are coming in from forests and fields, and I've heard whispers that this year's morel harvest may be a big one. 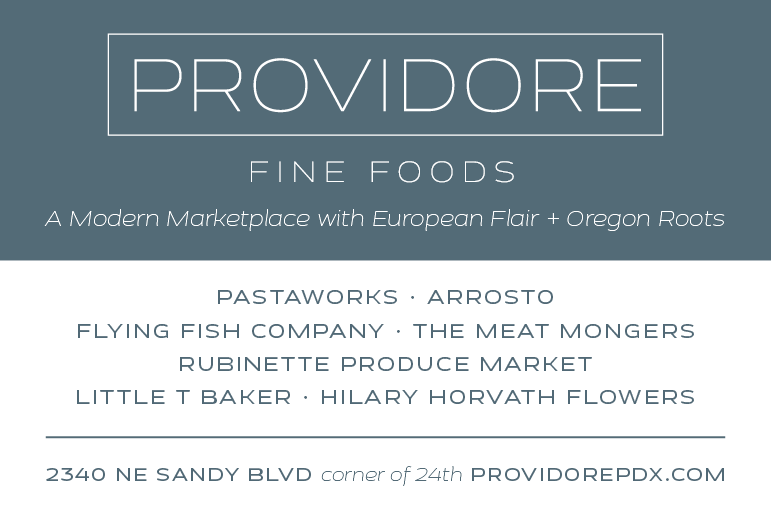 Though Josh warns that false morels, or verpa bohemica, a species of fungus known informally as a "false morel" is sometimes sold as a true morel, so be sure to ask your vendor. Still two to three weeks off, according to Mr. Alsberg. Look for them at the end of April or the beginning of May. He said that Unger Farms in Cornelius is the driver for strawberry season in the Willamette Valley, and the first to appear will be Albions, followed by Seascapes. The first Hoods will most likely be available around Memorial Day, though—and this is a mantra we should all take to heart—"everything is subject to Mother Nature."